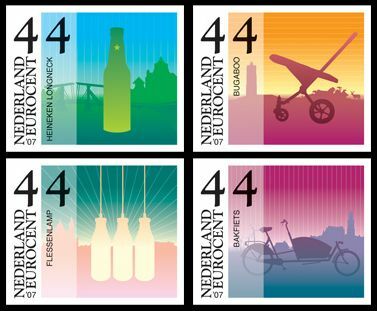 For its new, 2007 stamps, the Dutch post office, TNT Post, commissioned the Amsterdam firm ...,staat to create a series of Dutch design icon stamps. Not like windmills or wooden shoes or anything [though tulips did make the cut]. You know, quintessentially Dutch things. Like the Gouda cheese slicer, the Bakfiets dadbike, Heineken Longnecks. And Bugaboos. That is awesome, but if ...,staat thinks this is going to make up for the whole Smurf-on-white Bugaboo By thing, well, we'll have to wait and see. Let's just say it's a step in the right direction.